achievements and successes in Team Pukeko next year. My passion in the classroom is to deliver creative and exciting programmes to engage our young learners and foster a lifelong love of learning. Outside of the classroom I enjoy spending time in the outdoors with my horses, my dog (who is the size of a horse) and my wonderful family. I will be in my second year of teaching in 2019.
important things in a classroom. I strive to make my lessons challenging and memorable for my students. Student agency and independence is a huge aspect in my classroom. Teaching in New Zealand for 16 years with experience from New Entrants through to Year 6. Experience teaching within mainstream and enrichment Gifted and Talented classrooms. Seven years experience as a Learning Support Teacher catering for students who required reading, writing, numeracy and ESOL support. Ran Learning Staircase Support Programme for students with dyslexia. My passion in the classroom is to deliver exciting and creative programmes which foster a lifelong love of learning. 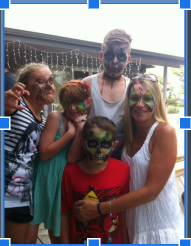 Outside the classroom, I love to spend time with my family - bush, beach walking and travelling. I have a passion for archaeology and history. I am an avid reader. I have been teaching for 2 years and will graduate at the end of the year, becoming a fully registered teacher. In the classroom I like to give children every opportunity to experience the value of learning and developing their own confidence in making continual learning a part of their future. In my spare time I love to spend time with my family, run, go camping, going to the beach and summer holidays. Silverdale School is my second home and I feel blessed to work alongside the collaborative and supportive Pukeko Team. Creating a calming environment, incorporating mindfulness and yoga into the curriculum is a passion of mine. I inspire children to believe in themselves and embrace a growth mindset. Building positive relationships and understanding children's individual qualities, allows me to push them to be the best independent learners they can be. I’m passionate about the outdoors, sport and incorporating new ideas into the classroom environment. I enjoy enriching the minds of our future leaders, making learning fun with cross-curriculum. With extensive travel under my belt, I’m eager to implement my wealth of knowledge of diverse cultures and embrace new opportunities in the new year. After many years of teaching Literacy based programmes both here at Silverdale and privately, I am very excited to be taking up a classroom role again. As a teacher I am passionate about Reading and love to read myself. I live in Taupaki and love to be outdoors, especially with my dog. You can also find me in the gym or spending time with my family. I see my role as helping students to be life-long learners and to engage with opportunities. I have a growing interest in teaching Mindfulness to children and helping them to cope with stress. I am super excited to be a new addition to Team Pukeko in 2019! I have been teaching for 6 years and have just completed my Postgraduate in digital collaboration and leadership. I have a passion for digital technology and how to use it to support learning programmes within my classroom. I am reading recovery trained and love a good book. I strive to challenge my students, to get them thinking outside the box and develop problem solving skills. I spend most of my free time either playing netball or hanging out at my local markets with a good coffee! 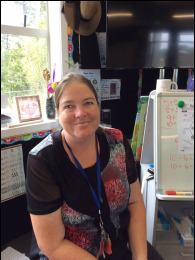 With over 20 years teaching experience, I feel very proud and happy to be part of Team Pukeko at Silverdale. I have taught at a variety of Year Levels from New Entrants through to Intermediate. I believe in forming dynamic and warm relationships with the children. When we are all happy we can learn and grow. My passion is Environmental Education - I love teaching children how to look after the planet and how to be sustainable. Garden to Table has been a dream come true for me. Teaching children how to grow, cook and eat healthy delicious food. I am a keen advocate of Permaculture. I have an adult daughter who has just finished her first year in Auckland university, and a kiwi husband who spends his spare time playing with his electronic stuff. I love gardening and I call myself a gardener. Teaching is just like gardening in many ways. We need to know our students well and have their interests at heart in order to find the best way for them to learn and grow. I see myself as a learner. My passion is to create a positive learning environment for our young people to develop skills, to become confident, connected, actively involved, and lifelong learners.